Hi guys! I’m Amira, a lawyer, and a blogger from ASelfGuru.com. 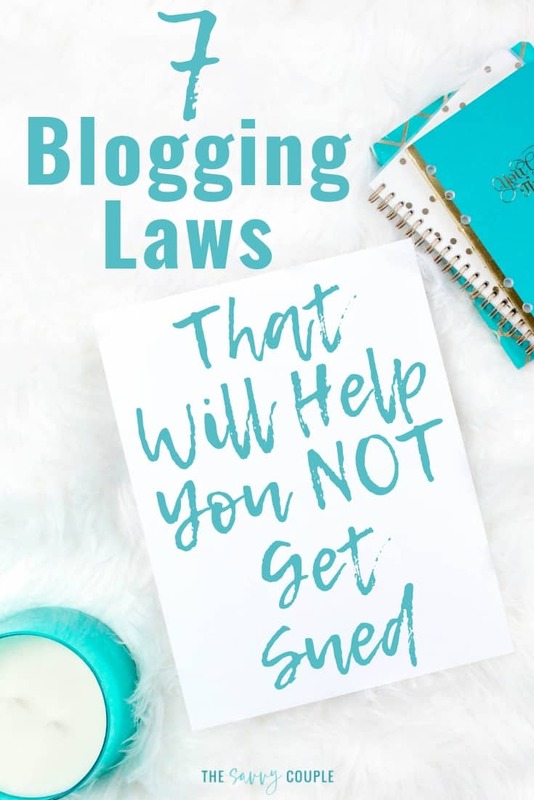 Thank you, Kelan and Brittany for affording me this guest post opportunity to write a legal guide for bloggers discussing the 7 blogging laws you must know. The legal side of blogging is often neglected because it is not fun and most bloggers give up trying to understand it. This is the reason I’ve put together this legal guide for bloggers to help you become compliant with the law and stay out of legal trouble. Almost all bloggers collect some sort of personal information from their visitors whether to grow their email list or to sell a product or service for instance. Even if you are not monetizing from your blog, you are probably still collecting personal information from others. For example, if I subscribe to your blog, you have now collected my personal information, which is my name and email address in this case. Similarly, if I purchase a product from you, you have now collected my credit card information, name, email address, billing and/or shipping address, etc. The Federal Trade Commission (FTC) regularly brings lawsuits against online companies that have violated consumer privacy laws. Most recent examples include Google and Facebook – they both have been sued for privacy violations. To make your head hurt, even more, the GDPR applies to you whether you are in the European Union or not. It is a privacy law that is put in place to ensure proper handling of personal data related to EU citizens, and there are serious hefty fines for not complying with it leading up to 20 million Euros or 4% of the annual revenue, whichever is greater. Just like you go to the doctor for health advice, trust the lawyer with the legal stuff to help you comply with the different rules and regulations. I’ve helped hundreds of bloggers with my Legal Bundle already, so if you are wasting valuable time trying to put together these legal pages yourself then take a break, relax and let the Legal Bundle do the work for you! It’s very easy to customize and believe it or not, you will be done with all your legal pages within minutes! Check out the awesome testimonials here. I will speak about copyright law in the context of blogging only because it’s a vast area of law that I can write a whole book about! You get copyright protection for your original work instantly, meaning the moment you create your work, its protected. It’s not necessary to register with the U.S. Copyright Office to receive this protection. But you do have the option to register your work with the Copyright Office in Washington, DC. This would require sending them copies of your work along with a registration form and fee. Copyright registration is beneficial if you want to be able to bring copyright infringement lawsuits and claim statutory damages for the violations. The purpose of copyright law is to protect your work and allow you to profit from it while encouraging intellectual and artistic creation. You get certain legal rights to control how others can use your work. If someone wrongfully uses your copyright material without permission, you can sue him or her to obtain compensation for any losses. Before March 1, 1989, you had to use the copyright symbol as part of a valid copyright notice to inform others that your work was copyright protected. But the laws changed and all works published after March 1, 1989 no longer require you to provide this notice. This is because as discussed above, your work is automatically protected from the time it is created. Use the copyright symbol – © – or the word “copyright” or abbreviation “copr” (although this abbreviation is not used as often). As an example, this is how your copyright notice should look: © 2019 The Savvy Couple. All rights reserved. You must have seen this in the footer section of all blogs. “All rights reserved” is not legally required but again, it puts others on notice that your content is copyright protected. You should NEVER copy anyone’s writing or any work without seeking permission or giving proper credit to the author. Never steal or copy someone’s blog posts, images or anything else that does not belong to you unless you want to be sued for copyright infringement and face severe legal consequences. Once you are sure there’s a copyright infringement, send a cease and desist letter or email to the infringer demanding that your copyright work is removed. If after sending the cease and desist letter, your copyright work is not removed then you need to send a Digital Millennium Copyright Act (DMCA) Takedown notice to the infringer’s Internet hosting company, search engines, etc. 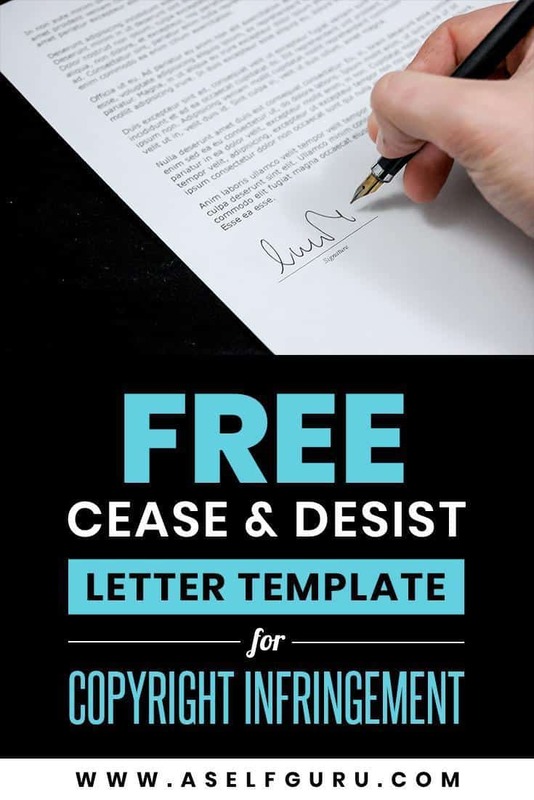 I have written thousands of cease and desist letters in my legal career, so feel free to grab my free cease and desist template here. It’s not required to send this notice and you can sue instead but lawsuits are expensive and long lasting! Plus, if your copyright is not registered then filing a lawsuit won’t help you. You would have to first register your copyright to be able to file a copyright infringement lawsuit. So it’s much more cost effective to try to resolve the legal issue this way first before hiring a lawyer to file a lawsuit on your behalf. In most cases, the cease and desist letter will work and you won’t have to spend the time and money looking for a lawyer. Talking about lawsuits, nobody wants to be part of them! But if you do get sued then having proper terms and conditions on your blog from day one will protect you! Most bloggers don’t realize this until after they are sued! (when it’s too late). At that point, the lawyer can’t help you much because you failed to set up your online business the right way from the beginning. 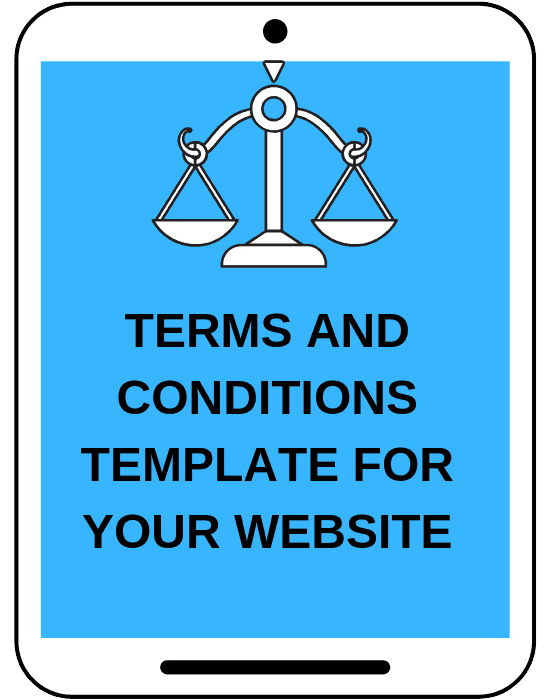 You need to have a thorough Terms and Conditions on your blog that protects you and your online business. 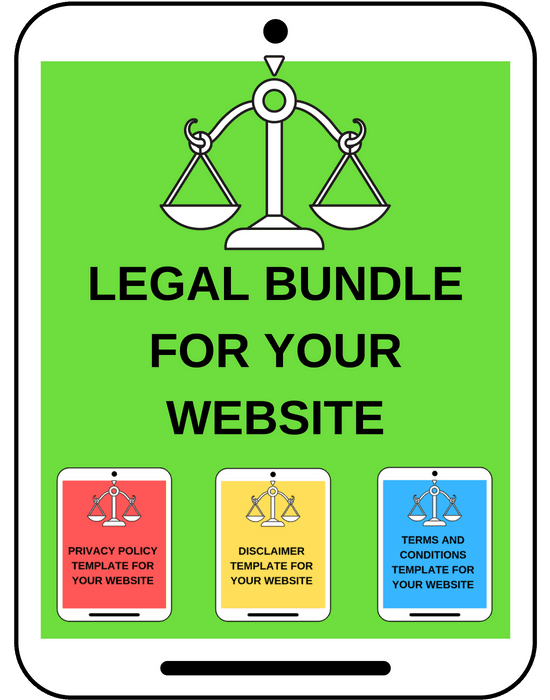 If you look at my super affordable Legal Bundle then you would see that I include a Terms and Conditions template as part of it along with 3 bonuses! As bloggers, you have to be careful about what you write about others. One of the laws you should know about is called defamation. Defamation is when you publish a false statement about someone that harms that person’s reputation. For example, let’s say you publish a false statement about your competitor that affects his or her business’s integrity, credibility, credit or solvency. You could be sued for defamation now! Read this recent case of a blogger being sued for more than $15,000 defamation damages in Florida! The takeaway is what you publish must be a false statement for it to defame someone. You must have seen disclaimers everywhere. See my legal disclaimer above as an example. Disclaimers are used all the time on websites to protect the business from lawsuits. It is a way to shield you from legal liability. For example, if you have a health blog offering medical information, then you must have seen a disclaimer on that website stating to consult a doctor. This is to make it clear that the medical information on the website can’t substitute a doctor’s advice. You should have appropriate disclaimers on your blog making it clear to your readers that what you publish are not statements of facts but rather your personal opinions. This kind of disclaimer helps to protect you from defamation lawsuits too. Having a disclaimer on your website does not mean you will never get sued but the chances are, if you do, they will serve as an affirmative defense and help bolster your case in front of a judge or jury. Another reason why you need disclaimers is to protect you from what you publish from third party websites on your blog. You don’t want to be held responsible for what other websites publish, just because you share those affiliate links on your site. As bloggers, we share all kinds of third party links on our website such as the affiliate products we recommend. So make sure to always have a disclaimer on your blog! 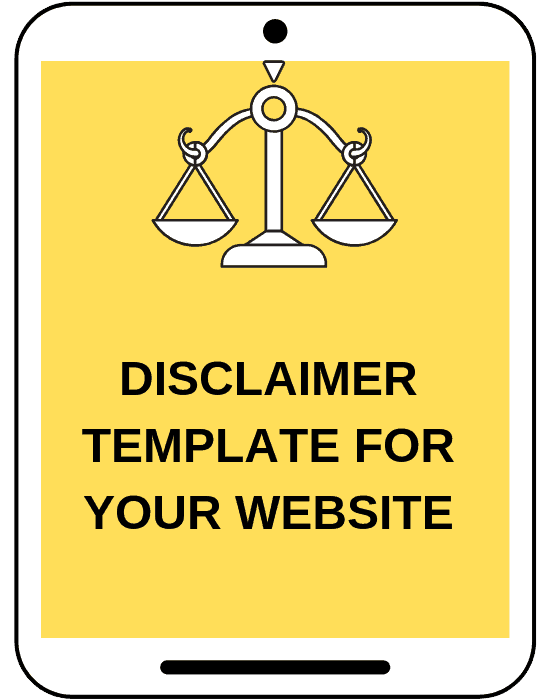 You can grab my super easy Disclaimer template here, which includes all the proper legalese you need! Many bloggers confuse a disclaimer with a disclosure. They both are different. A disclaimer, as explained above, is where you “deny” legal liability for the content you publish on your blog. But a disclosure on your blog is where you reveal your affiliate relationships, sponsorships, and any other endorsements, so your readers can make well-informed decisions. The FTC protects consumer rights and to ensure transparency, honesty and prevent misleading advertising, they require you to disclose your affiliate relationships for the products you recommend as well as any other sponsorships and endorsements. Most bloggers are affiliates for other people’s products. This is pretty common because we all have used other people’s products that we love and recommend. As an affiliate, you earn a commission and receive compensation if someone makes a purchase from your affiliate link. But you must disclose to your readers that you have financial relationships with third-party companies in which as an affiliate, you will gain financial rewards, commissions or other incentives if someone makes a purchase from your affiliate link. Similarly, if you publish sponsored posts on your blog then you need to disclose those as well following the same rules above. Otherwise you and the sponsored company both risk getting fined by the FTC. Always remember to disclose the incentives you receive for publishing something, whether that’s monetary compensation or free products. This will not only ensure fair ethical business practices but also keep you away from lawsuits. If you need help, just grab my Legal Bundle. 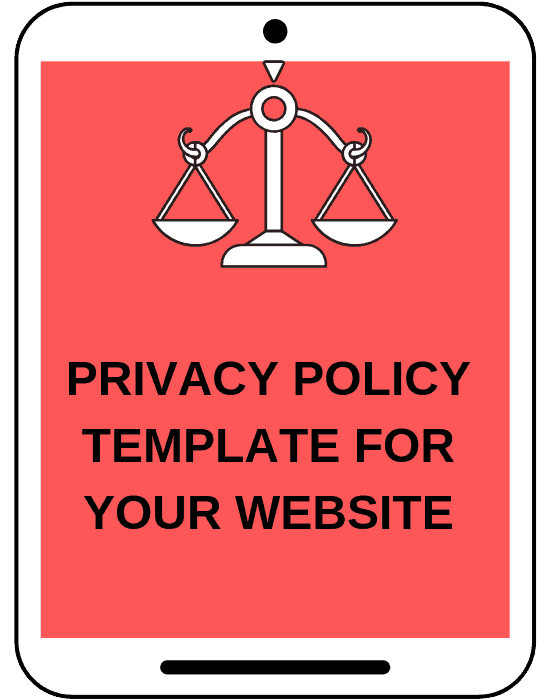 My disclaimer template in there already includes the affiliate disclosures, sponsored posts disclaimer and other disclaimers you need on your blog to protect you legally. Assuming your blog is not a hobby but a legitimate business, you need to make sure you are complying with the Internal Revenue Services (IRS) regulations related to your self-employment taxes. Yes, you are your own boss now but that comes with more responsibility! You will have to pay social security and Medicare taxes on the profit you earn from your blogging business. These taxes are called self-employment taxes or SE taxes. You are responsible for paying these if you make $400 or more annually from self-employment. I wrote a post that provides more in-depth information on the top 7 tax tips you need to know as a blogger. If you are not comfortable doing your own taxes (as most people are not, including me!) then it’s best to hire an accountant to handle all this for you. But at the same time, you should have some general knowledge of self-employment taxes and how to keep track of your expenses from the onset so when it’s time for taxes, you are not scrambling! Kelan & Brittany have an awesome electronic monthly blogging income tracker you can grab a copy of here. Amira is a lawyer, blogger and business coach from Florida. She blogs at ASelfGuru.com where she teaches you how to protect your online business legally along with the business skills you need to become your own boss! Grab your free business and legal checklist here. Is your blog legally compliant? Comment below to let us know! Thanks for this easy to follow guide to this oh so important legal side of blogging. Definitely don’t want to end up in blogger legal trouble! You are so welcome! Yes, the legal side of blogging is super important and sometimes overlooked until you get sued. Hope this post helps new bloggers protect themselves and their online business legally. Hey, Amira! This was an excellent article! You’ve done a great job explaining how these laws impact bloggers. This was useful information that all bloggers should understand. Thanks for sharing your expertise! This post was very helpful! All the legal stuff in blogging can be so confusing! This is an amazing post, full of details and helpful information for a new blogger!! Thank you!! Thanks, Sasha! Glad you enjoyed the post. Thank you for an amazing post!! Very helpful and thank god I purchased your legal bundle!! So much great information! It can definitely get overwhelming for a new blogger like me! So glad you shared this, especially the part about self-employment taxes. There’s so much to consider when blogging. But, the more we treat our blog as a business, the more we can grow. Thanks for the tips!